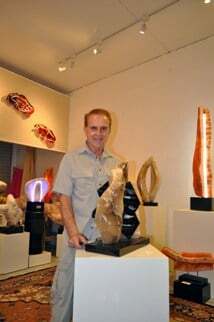 Born in New Jersey, he has spent most of his life on the Eastern coast of the U.S. Having an inherent artistic gift, he began sculpting in a primitive way at the age of five. Much of his schooling concentrated on the sciences. He received his Bachelor of Arts degree in Biology from C.W. Post College in 1967. It was during his studies here that his talent was recognized by famed sculptor and professor, Alfred Van Loen. Shapses then completed four years at Temple University where he graduated with the degree of Doctor of Dental Surgery in 1971. During these four years, anatomy professor Charles Santangelo had also recognized the artistic strength that Shapses had so well put forth in the required sculpting exercises for the anatomy courses. Shapses’ sculpture is prominently displayed in private collections and public places throughout North and South America. His remarkable skill for portraying balance and movement is expressed in his abstract forms. The creative forces that give vitality to his realistic pieces is seen throughout his life forms. The more avant-garde statements that are made in the mixed neon and stone media elicit an excitement that occurs when the artist takes a quantum leap toward ingenuity. Whether realistic or abstract, the viewer’s tactile senses are aroused with almost a sense of urgency to explore each form in greater depth than just visually. This indeed is and continues to be a main objective of the artist as he creates his work. From the architectural impact of Shapses’ abstract art forms, illuminated with fluid neon and led lights, to the sensuous capture of images penetrating stone, the artist is a sculptor for all seasons, personifying an enigmatic constant of precision and release. Joel Shapses was inspired by his muse even as a young child and never wavered in dedicating time to his creative pursuit through all the demanding years of acquiring his higher education. His gift did not go unrecognized by famed sculptor and professor, Alfred Van Loen, and professor of anatomy Charles Santangelo, who, along with Enzo Gallo provided him with motivation to invest in his artistic passion. His portrayals of the innocent koala bear “Hitching a Ride” in the marsupial pouch and owls piercing the uncertain night with relentless eyes, nor his dignified silhouettes of man and raw torsos of woman never suggest the departure into pure form expressed in his visions carved freely into marble, translucent alabaster and limestone. 0f equal measure is the man: a composition in extreme contrasts. During his travels throughout the world, Joel developed an advanced knowledge of the various stones that would become an integral part of his creative process. With insight into the capabilities and limitations of his medium, he originates artworks with the drama of an electrical storm and the pathos that even the blind can see: His forms are irresistible, demanding to be touched. It is this excitement in his work that has impressed private collectors from across the United States, Canada and South America. It is the universal appeal of his constructions that has driven the success of his art in public showcases and won countless accolades from his peers as well as his clients. His numerous achievements in the competitive arena have not altered the humility of a man who says of his moving works, in a quiet voice, only “I know when the piece is done “. Clearly, the stone speaks to him in a language that he alone can understand. Appreciating the perfection of his conquest, it is impossible for even the trained eye to detect, how did he see it- this essence of form within the rubble of the quarry? How did he know it was there? Soon after his travels, he relocated to South Florida which has remained his residence since 1972. Early on in his sculpting career, he worked under the same roof as famed sculptor Enzo Gallo. This is where Shapses created one of his largest commission pieces to date, a six foot abstract for Saks Fifth Avenue in Fairlane Michigan. The piece was commission as a focal point for the premier anchor store for the Fairlane Mall. Minnesota marble was his choice for this work as he felt the need for using domestic resources for this project. He designed and created his works from his studio located in Fort Lauderdale, Florida. He served as President of the Broward Art Guild from 1977-1978. 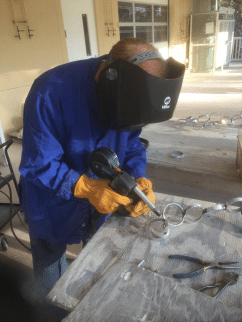 Although the majority of his works are non-commissioned, he enjoys the challenge of working with the client that has specific ideas that they wish to be transformed into one of his creations. Mild mannered and introspective, Shapses’ work is the quintessential expression of art communicating feeling. Since his retirement from dentistry, Joel has more time to devote to his true passion. He is now exploring new art forms which include fused glass, bronze and metal. He maintains a studio and Gallery located in Naples at 6240 Shirley Street,#102 where he designs and works on used glass sculptures. 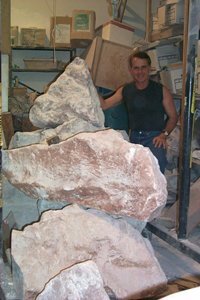 Larger stone sculptures and metal sculptures are done in a studio located in Bonita Beach,Fl. To date Shapses has completed over 700 sculptures. Shapses has won over sixty awards for his artistic excellence.